My 3rd round of Obagi! I tried Skinmedica’s system and was disappointed. I have spent a lot of time in the sun during my younger years. I have mediaum-dark skin tone (bi-racial) in my late 40s. I use my clarisonic brush for cleansing. My derm sells this for nearly twice the price. THANK YOU for stocking it! Achieve a radiant, even skin tone when you use Obagi's Nu-Derm FX system for normal-to-dry skin. This formula is hydroquinone-free to reduce the risk of irritation and helps reduce dark spots and discoloration to make your skin appear more youthful. Great system for keeping skin healthy. I've used the products for two years. 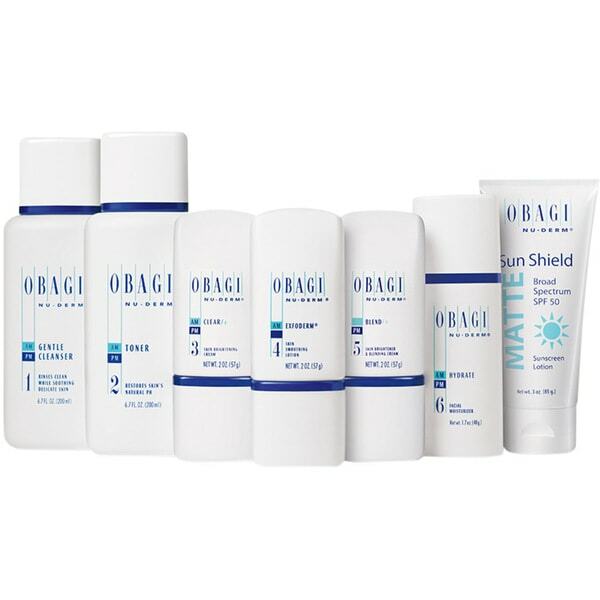 I tried another product and was disappointed so went back to Obagi. Your skin looks better the longer it is used. It appears smoother and glows. Since I've been using these products for 6 months and feel very satisfied. My face looks clean and brighter. I feel confident when going out without make up. Works so well that all my friends and family noticed and they also wanted to try the product. I purchased the Obaji Nu-Derm Fox System for Normal to Dry Skin to help clean up my skin. It is very drying, but that is to be expected because of the whitening agents. The price on Overstock compared to my dermatologist’s office is amazing. I highly recommend buying this set here! I have been using this products for many years and this pkge. has the full sizes. Otherwise you have to buy them separately and they come to much more. I've been using this product for a couple weeks now. I was worried about my skin drying out but it hasn't. The whole system of products all seem very gentle and do not have a strong scent which I appreciate. The lotions do not leave you feeling oily or over moisturized, it all soaks in nicely. I'll update further along if anything changes throughout my experience. Although I don't have any major concerns that I hope this system addresses I believe a good product will be make a difference even if it's just me who notices. My skin has never looked better! I will continue to use Obagi Nu Skin for the rest of my life. Dark spots have faded. My skin is smoother. I look younger! I must say I'm am very impressed with my Obagi purchase. I had a friend I have not seen in months. When I did run across her, I could not help but notice how clear and bright her skin looked. She informed me it was the Obagi system she was using. I immediately ordered mine and have been using it since March 1, 2019. My skin feels very silky and is beginning to get that clear glow that I saw with my friend. I would highly recommend using this product if you want to have beautiful skin within weeks. I highly recommend this product for anyone and especially for those of us with mature skin. I purchased the Obagi just a few weeks ago and can already see the changes occurring in my skin. My skin feels soft and looks much more radiant. This product is very affordable and offered at Dermatologist offices for a much higher price. Thank you Overstock for such a great price and product. Love it! A friend recommended this set of products and I have been using it for over 2 weeks. So far it has worked well, my skin is brighter and feels healthier. Update: 7 months have passed and I still love using this set. My skin looks great. i have used this product for a long time. you can see fast results,but you need the kit. it is a little expensive but you can order one at a time. that is what i did. i love this product. its worth a try. your face gets brighter and in my opinion makes you look younger. The Obagi Nu-Derm has worked excellent for me. I purchased for the malesma on my uppper lip area. I have noticed that even though it's not completely gone, it has significantly improved it. "This product it’s full size or travel kit ?" This is the full size. my daughter uses this product and loves it. Do I thought I would try it... She Looks great! i have been using obaigi products forr more than fifteen years and my skin is looking younger than my age of 73. I also have been using tretonin creme but you don seem to offer it anymore. "Ok thanks for that. Are all the Obagi products sent via Overstock and ** different than what you obtain at a doctors office or is it just the clear (#3) that is formulated differently?" The FX kits do not contain any hydroquinone in them. The ingredient that lightens the skin is the arbutin in the FX kit. It is a more healthier alternative to hydroquinone. "Are these products fake? How can Overstock guarantee these products since they are not an "authorized " distributor. Are these products sourced from the manufacturer?" They are not the same product you get from the doctors office. Unfortunately I found out the hard way. This product is Obagi "Fx" NOT Obagi "Rx". It does not contain the main ingredient that lightens the dark spots-- hydroquinone. "what is the expiration on this?" The expiration date wouldn't matter because this is not the product you think you are getting. They are not the same product you get from the doctors office. Unfortunately I found out the hard way. This product is Obagi "Fx" NOT Obagi "Rx". It does not contain the main ingredient that lightens the dark spots-- hydroquinone. "what is the expriration date on the product? how many ounces are the toner and clenser?" Unfortunately, we are unable to provide further information as we no longer have this product in stock. Is this definitely the brand of Obagi, the same quality as available in my doctor's office?